As more and more people join the rapidly-growing gig economy, the concept of the home office is taking on a brand new meaning. Working from home will soon be the new norm for a large percentage of American workers. But, the switch from nine-to-five to freelance comes with quite a few necessary adjustments. If you’re thinking about giving up your commute, or have made the switch from an office job, and want to make the most of working from home, we can help. 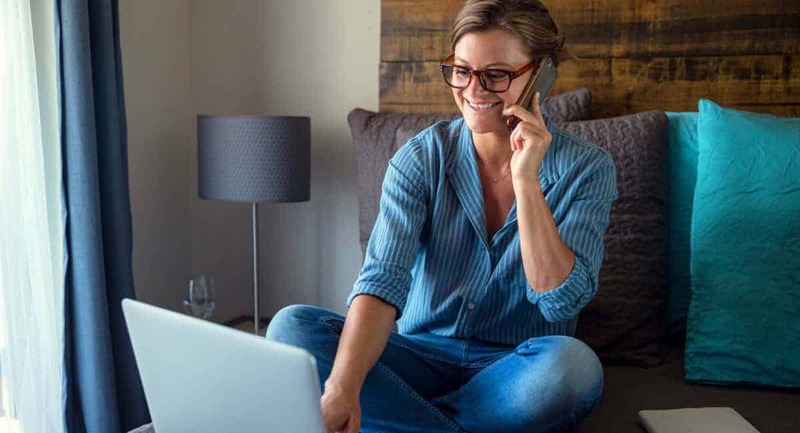 Here are eight must-have work from home tips that will help you find success in your career without having to leave your house. When you work in an office, you’re forced to keep to a work schedule. While you may take your work home with you or clock in a little overtime at your desk, there is a distinct difference between “on” hours and “off” hours. When you make the switch to working from home, it’s essential that you create and keep to a schedule like you would when working in an office. By maintaining an eight-hour workday, you’ll be less inclined to slacking off or procrastinating. And, more importantly, will be better able to regulate your all-important “off” hours. Though many people like to maintain the conventional nine-to-five format, you can build your schedule however you want. The key is to stick to your work hours, no matter what they are. Even though the idea of working in bed might seem appealing, bringing your job into your chill-out spaces can be dangerous in the long run. When you work in a regular office, your designated workspace is your desk or cubicle in a place detached from where you live. When you work from home, you need to draw a hard line between workspaces and living spaces. If you have a home office, reorganize it to include only work-related objects. You should try to treat it like you would a regular office. If you’re not working, then you shouldn’t be there. If you don’t have a separate room to dedicate to your work, then try to give yourself a desk or other designated place to work. Whether you run your own business or work as a freelance writer, you probably have a few tools that are necessary to get the job done. Whatever these tools may be, you need to keep them organized and all in one place if you’re going to work from home. Having to dig or search for things can put a damper on your productivity. So, everything from your laptop to your certified mail labels, which you can find out more about here, should be within arms reach. Working from home is becoming more common. That said, some people still have a hard time understanding that just because someone is home, that doesn’t mean they’re available. When you work from home, you’re still working. So, you need to take steps to make sure everyone who lives with you understands that they shouldn’t disturb you during certain hours. Setting up a work schedule and designated work area can help you to draw the line between work time and free time. But, it’s your job to enforce that line. When you don’t have to worry about a manager peeking over your shoulder every few minutes, it’s easy to let yourself get distracted. Which, is something that is particularly true for people who are new to working from home. You can tell yourself “one more video” or “five more minutes.” But, keeping yourself away from distractions can feel impossible and before you know it you’ve lost an entire day. The trick to getting past distractions is acknowledging that they will happen. Once you do that, you can then take steps to prevent yourself from accessing them. A great place to start is by downloading an app that blocks certain websites or applications during work hours. Working in your PJs can be a treat every once in a while. But, if you work from home, you shouldn’t make a habit out of living in your sweatpants. Studies show that people who get themselves dressed for work are more productive than those who don’t. On top of that, you never know what your day might bring. You wouldn’t want a surprise video conference to catch you with your pants down. Nobody knows you or your work habits better than you know yourself. And, while these tips can help you establish a good at home work ethic, you should treat them as a guideline and not the law. When you work from home, you have no one to answer to but yourself. Which, means you get to create your own rules. If you work better at night, then go ahead and work at night. If you think better in a noisy common space than in a private office, then work in your living room. Before you set your ground rules, take some time to figure out what makes you productive, and stick to it. Finally, when you work from home, it can be pretty hard to turn yourself off and stop working. When you start working from home, you need to make sure you’re still taking the time you need to keep yourself firing on all cylinders. One of the best ways to do this is by keeping work within your designated work hours. Once quitting time rolls around, shut down your computer and step back for the rest of the night. Working from home can be a fantastic situation. That said, it can also make it easy to fall into a 24/7 mentality, which will lead to burn out. By taking care of yourself, you can help yourself be more productive in the long run. Working from home may be on its way to being the new normal, but it can still be a challenge for those who have never done it before. By following these work from home tips, you’ll be able to create a schedule and environment that will help you succeed in all your ventures. Are you looking for more helpful business tips, tricks, and hacks? We’ve got you covered. We have dozens of articles on everything from starting your own business to building your dream home office. Check them out today!